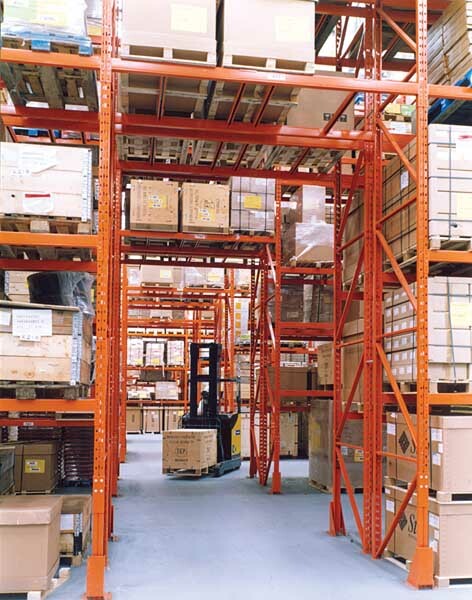 “Redirack is now Motorola’s preferred supplier for all racking installations”. These are the words of Motorola’s Chris Palmer following our recent installation of a wide aisle racking system at their Europark warehouse. Motorola is a global leader in providing integrated communications solutions. The company’s Groundwell site, near Swindon, is their European headquarters and production facility for the manufacture of GSM systems, the cells that enable cell phones to communicate. The global market for mobile telecommunications equipment and consequently Motorola’s GSM products, is booming. Europark is a feeder warehouse for the Groundwell manufacturing plant. Motorola recently invested £200,000 refurbishing this facility. The improvements have enabled them to better support their varying production needs and dispense with the 3rd party storage facility they were hiring. UK and European subcontract manufacturers deliver parts to Europark, where they hold them in stock for the production plant. Stock here is primarily buffer stock with the main shipments going directly to Groundwell. Even so, 200 pallets of components will be shipped from Europark everyday using a fleet of dedicated vehicles. 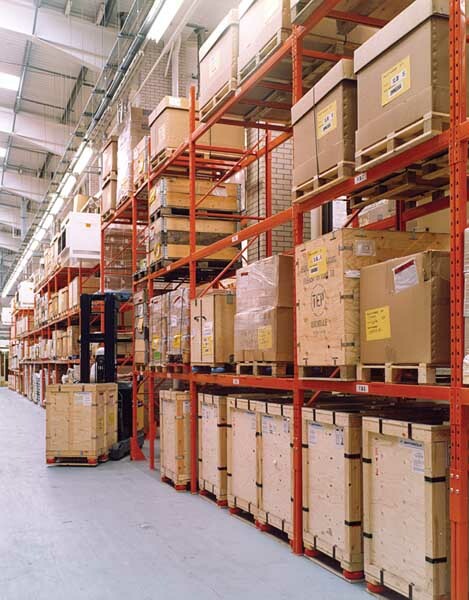 Within the warehouse we built a wide aisle storage system providing 5,200 pallet positions. Arranged in an area of around 50,000 sq. ft the racking has seven double runs and four single runs of varying lengths. Rising to a maximum height of 7.8 metres, the system is designed to store both Euro and UK pallets. 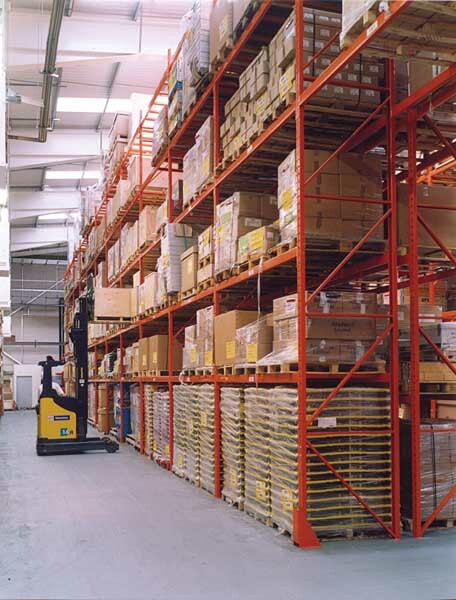 Two UK or three Euro pallets can be stored at each beam level within the 2.7 metre wide bays. As the building has a variable clear headroom, the racking height varies as well as the number of beam levels within each run. An interesting feature of this store is that three runs of racking have a 1400mm frame depth, and are fitted with four pallet safety bars per pair of beams. 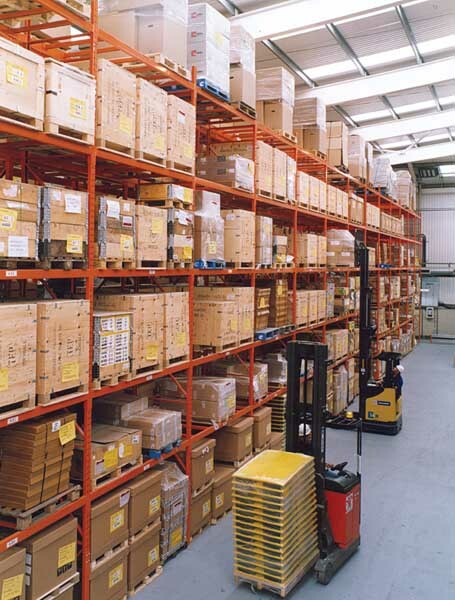 This gives Motorola the flexibility of storing oversize loads or standard pallets within the same bays. Pallet safety bars are also fitted in some top locations as an added safety feature. Completing the installation is a tunnel running through half the racking block to improve access. Flexibility is a key issue with Motorola. With their business changing so quickly they needed a racking system that could be adjusted and a supplier that would respond to their last minute changes. As Chris Palmer is happy to confirm, “Redirack met our installation schedule exactly and were flexible in coping with last-minute installation changes.” Since the installation Motorola has changed the racking configuration several times in-line with their changing needs.